At long last, Lori "Naughty" Sullivan falls in love in Always On My Mind, the new book in Bella Andre's New York Times and USA Today best-selling series about the Sullivan family. After a tragic loss three years ago, Grayson Tyler left his life in New York City behind and started over in the rolling hills of the California coast. He's convinced himself that all he'll ever need again is the blue sky, a thousand acres of pasture, and the crashing waves of the ocean. Until one day, Lori Sullivan barges into his life and promptly blows his emotionless and solitary world to shreds, driving him crazy as only a woman nicknamed "Naughty" can. But will Lori be able to convince him that it's safe to love her...and that forever isn't actually out of reach? This is one of the better Sullivan stories. This was naughty's story and it was very delightful. Such a wonderful happily ever after! 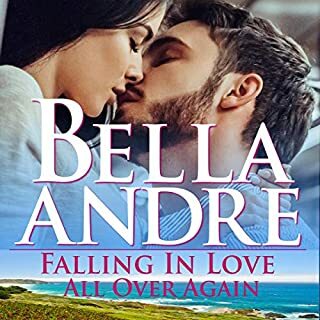 I have to say Bella Andre can do ROMANCE book 1 thru book 8 are GREAT a different type of romance for each brother and sister well done. Eva Kaminsky is becoming one of the best narrators. I want more please!!!!!! love Love LOVE those Sullivans!!! Finally Lori (Naughty) Sullivan takes front row in book eight. It's only fitting, she has been the upbeat glue used lavishly in the previous books to always speak her mind and cement relationships or make outlandish declarations. In this book we see the depth of her patience and her empathy come out. In this interesting plot, Andre paints a vivid picture of Lori and her romantic story. Grayson saw it coming, he just couldn't stop it. The setting on the farm is perfect. A better setting couldn't have been done. You will get you fill in the book. Just remember what goes around comes around. Thumbs up on this one. Published: Amazon Digital Services Inc.
"Always On My Mind" by Bella Andre was this author's eighth in 'The Sullivan's' series. This novel was of Lori (naughty) and Grayson love story. This novel will take you through many emotional feelings where you will find yourself laughing, crying and sighing n this hot steamy read. You will definitely be kept mesmerized by all of these fascinating characters of this wonderful Sullivan family. This author really works her magic with bringing together Lori's dancing world and Grayson the New Yorker who was now a farmer. In the end will they be the perfect couple for each other? This is where I say you must pick up "Always On My Mind" to see for yourself. Would I recommend this series? YES! This was another good Sullivan series! Did I get the same book as everyone else? This was the worst in the series and the worst in general. I waited thinking it would be the best but I was wrong. Too predictable! Unrealistic! No imagination at all. Seriously??? Would you listen to Always on My Mind again? Why? I'm sure I will listen to it again at some point. When I need a soft and whimsical love story, I always turn to one of the Sullivan books. What was one of the most memorable moments of Always on My Mind? All the moments with Mo/Sweetpea were poignant...and I love the barn dance. I like the cadence of her reading. She is very easy to listen to. I was waiting for "Naughty's" story...so much was hinted at in the last book and I knew that she had to have been in a bad relationship. I think the author found the perfect man for her! Another Great Book of the Sullivan Series! This was another great book written by Bella Andre. I loved the story line, I just wish it wouldn't have taken so long for Lori and Grayson to hook up together. I hope there is another book to continue on with the Sullivan series. These books are one if the first books that I started listening to and it is hard to top the Sullivan series.